The Sustainability Co-major emphasizes human-nature interaction in understanding environmental patterns and processes. Students are prepared to pursue a wide variety of career paths and post-graduate degrees in sustainability, especially those with design, management, and policy specializations. The Sustainability Co-major complements the primary major, which provides significant depth and breadth in an academic discipline. The Sustainability Co-major requires 38-48 semester hours, distributed as listed below. Depending on your major, some of these credits may also count toward your primary major. Students must complete a major in one of the divisions of the university. A workshop or one-time seminar on sustainability may be substituted with permission of advisor. The combined Master of Environmental Science program allows students to complete an M.En. 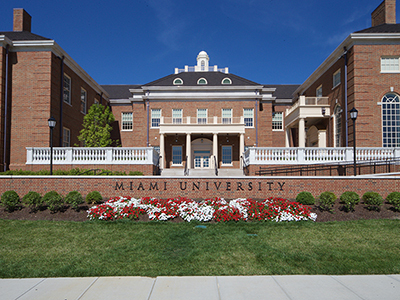 degree with 1 year of additional study beyond the bachelor's degree, and is available to qualified, tuition-paying students with an undergraduate Co-major in Energy, Environmental Science, or Sustainability at Miami University.